Water withdrawal prohibition enacted; Housing Bank funding delayed. In back-to-back votes on night two of West Tisbury’s annual town meeting, voters said yes to the sale and propagation of recreational marijuana in certain districts, and yes to regulations for withdrawing surface water. The Housing Bank funding article was put on hold until April 30, when a special town meeting will be held. In all, voters plowed through some 46 articles, most of which were basic appropriations. Contingent on special permitting from the zoning board of appeals, Light Industrial District 2, the Airport Business Park, became a lawful area to grow and sell recreational cannabis, and Light Industrial District 1, the neighborhood of Old Stage/Dr. Fisher Roads, became a lawful area to grow recreational cannabis, by a 125-18 vote. Whether the business park lawfulness would be recognized by the Federal Aviation Administration (FAA) was a question that arose in the debate ahead of the vote. However, Dukes County Commissioner Leon Brathwaite told the audience that based on a consultation he’d had with airport commission chairman Bob Rosenbaum, he believed the FFA isn’t concerned with the issue so long as it stayed outside airport gates. Brathwaite’s opinion jibed with what Rosenbaum previously told The Times. On Tuesday, Edgartown voters unanimously approved similar zoning for the part of the Airport Business Park that’s in their town. The West Tisbury Water Resources Protection Bylaw drew heat from some members of the farming community. The essence the bylaw was meant to conserve the Mill Brook watershed, conservation committee member Whit Griswold explained. Meadowbrook Farm owner Becky Cournoyer expressed concern about the ability of farmers and private landowners to draw water as needed. She also said she was dissatisfied with the language of the bylaw, which she found unclear. M.V. Agricultural Society president Brian Athearn, a farmer with water sources on his property, expressed some similar concerns. 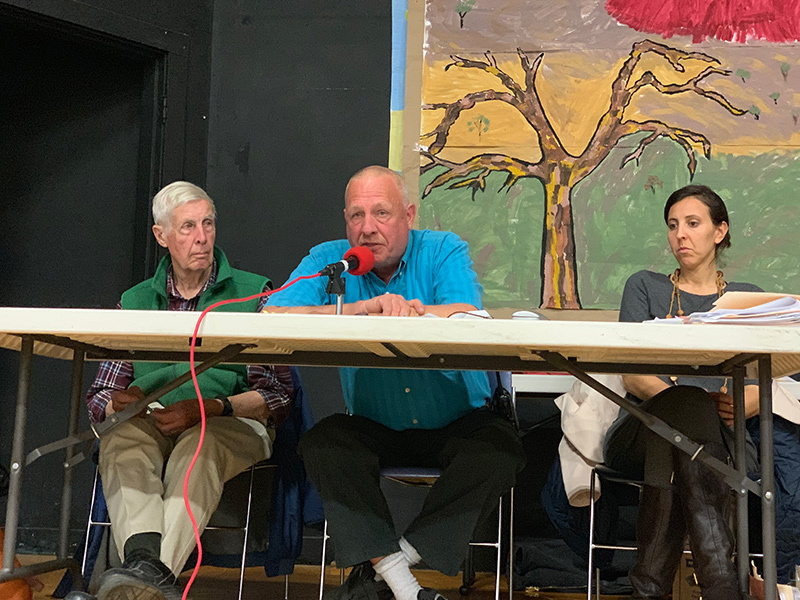 “I just wish this was a little more thought-out,” he said, and questioned the need for more bureaucracy in West Tisbury. Signmaker Tom Hodgson questioned the utility of having such a bylaw at all. New conservation commission member Geraldine Brooks said “unbridled” water taking was problematic to the health of the watershed. She noted hydroseed trucks made a habit of drafting from the Mill Brook at Scotsman’s Bridge, and that nobody knows what contaminants the hoses they use might be introducing into the brook. Ultimately the bylaw passed 111-25 with amended language. On the recommendation of planning board member Bea Phear, who explained the article was largely a consolidation and clarification of zoning, voters unanimously voted to approve a lengthy article governing special ways. After extensive debate, and a direct appeal from M.V. Superintendent of Schools Matt D’Andrea, voters unanimously approved a $138,138 appropriation for West Tisbury’s share of feasibility study and owner’s project manager costs for a high school renovation or rebuild. As the night wore on and the voters thinned, moderator Dan Waters was forced to dispatch counters to ensure there was still a quorum. The count found 136 voters present, 12 more than the threshold, and the meeting was able to roll on. In an unusual and perhaps unprecedented parliamentary move, selectman Skipper Manter moved to consolidate all nine Community Preservation articles for a single bloc vote. The appropriation value of the articles was just under $400,000. The motion and the article bloc both passed. To his recollection, he said votes of that type in the past have consolidated two or three articles. Such a smaller consolidation actually occurred earlier Wednesday night. Manter said he was motivated to make the motion in part because retention of a quorum increasingly looked tenuous. At the close of the evening, Waters stressed the meeting was not dissolved, only continued to April 30. He said the possibility to revisit articles already voted on in the warrant existed, if the need arose. Updated to correct what the zoning changes surrounding cannabis mean. -Ed. You have a bank willing to accept a marijuana-based business?